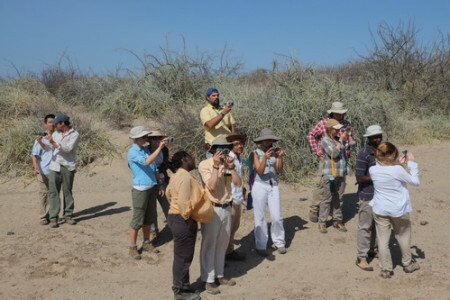 The Fall 2015 Origins Field School students have successfully accomplished the Ecology module by presenting their scientific thinking and design through their project proposals. Dr. Dino Martins, the director of Mpala, said that it had been a delightful two weeks to live and interact with the field school students. A follow-up blog will be posted for the last part of the ecology module. So stay tuned! 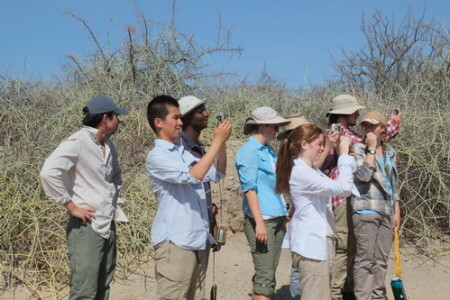 It is now the third week of the Field School semester and we have switched gears to start our second module: Geology. In the next two weeks, we will be learning about rocks, sediments, formations, members and the geological history of the Turkana Basin with Dr. Christopher Lepre. 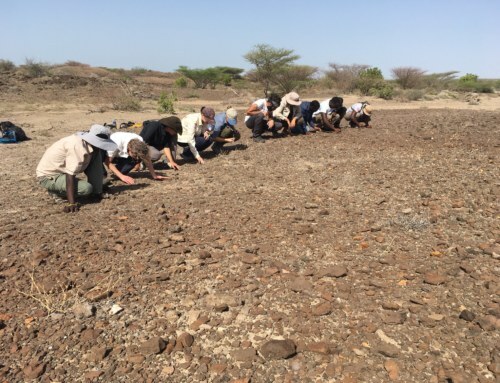 Dr. Lepre is currently using paleomagnetism to look at ancient history of Lake Turkana, at the Lamont-Doherty Earth Observatory of Columbia University. 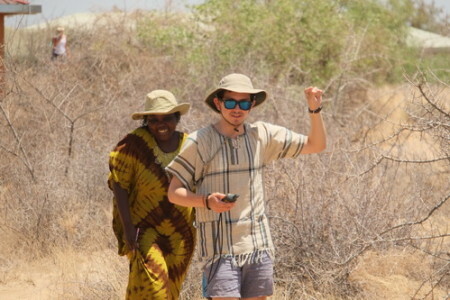 He has been working in the Turkana Basin for a long time and has taught the Geology module of the field school for a few years. 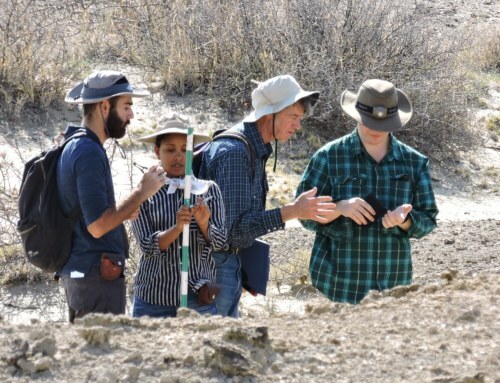 On the first day of class, Professor Lepre introduced maps, common geological terms and why we are using them. 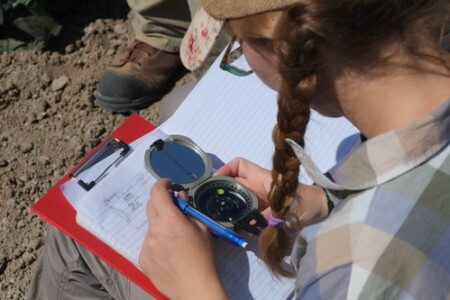 A very important component of the contemporary geological work is the GPS system. Before the GPS times, field work could be very difficult because of the relatively invariant landscapes (at least to me…) of the desert. 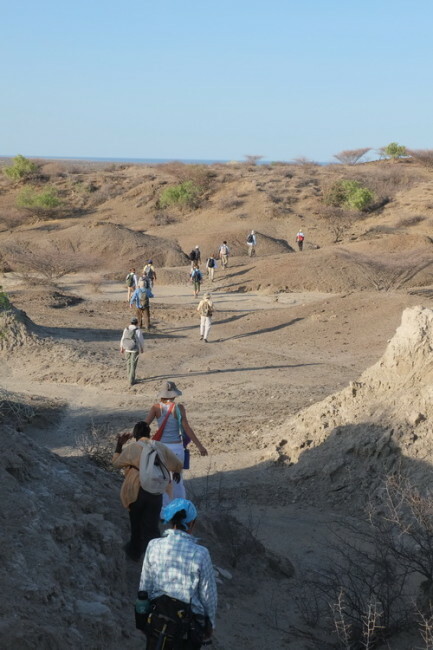 In some of the earliest field expeditions into the remote Turkana region, led by Dr. Richard Leakey, a lot of the mapping work was depended on the pictographic memories of the explorers. 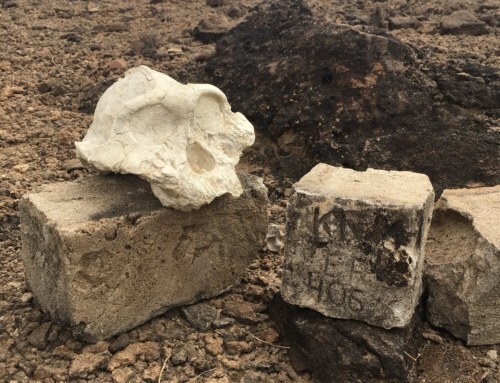 I’ve heard about stories of mapping fossil sites on aero maps and then from aero maps to the current GPS system, not an easy task at all! 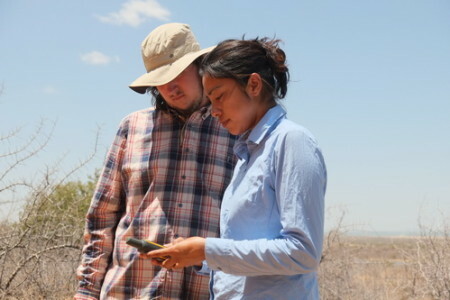 Thanks to technology, field work nowadays can be better planned and carried out consistently. A lot of time and effort saved! After class, students set out to do their first assignment: mapping the TBI Ileret compound. It was fun just to explore the wilderness and mark the buildings, paths, landmarks, etc., using their GPSs. 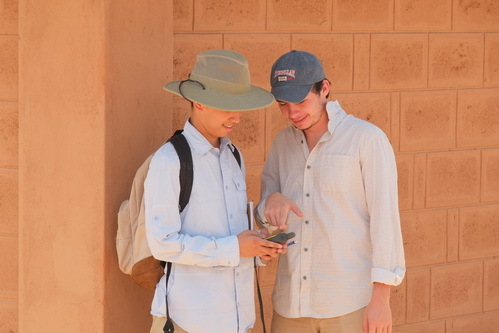 Based on the GPS waypoints with coordinates and tracking information, students are going to make hand-drawn maps of TBI Ileret camp. 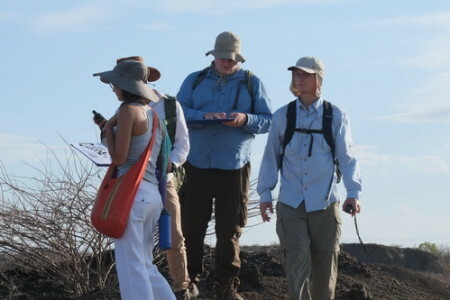 Deming (the blogger), Abel and Maria are looking at the GPS unit near the students’ mess. It is the first time that the field school is held at the Ileret fertility on the east side of the lake so we are expecting some different field excursions this time. The most exciting thing about having the field school here at Ileret is that there are plenty of geological outcrops around TBI Ileret. 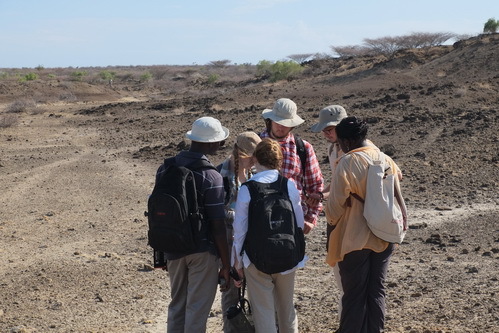 Today, students went out for a long hike with Dr. Lepre to the Northwest of Ileret camp looking at the Okote and Chari members of the ancient lake deposits. 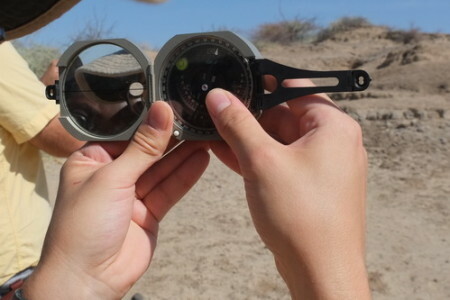 Students learned how to use compasses in addition to GPS units to find where they were. Dr. Lepre also introduced the history of the lake as how its level rose and dropped, and how this is relevant to the geological settings we are seeing today. The outcrops and exposures are slices of time in the past, bearing ancient sediments and remnants of organisms. 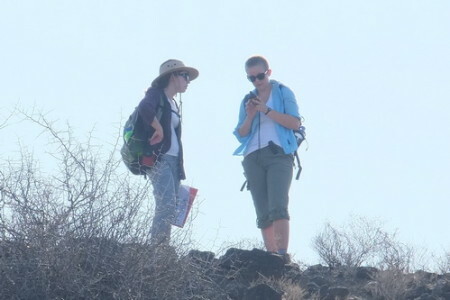 Many students explored the area with excitement, finding various fossils on their way. 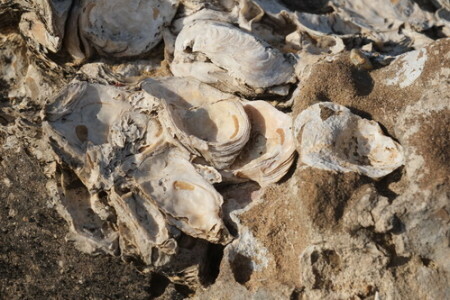 There are oyster shells and gastropods in the ancient lake deposits, showing that the lake had a different ecological composition in the past. The fieldwork was very rewarding because it complimented the lecture materials in the classroom. A bit of squinting to get the Brunton to work? 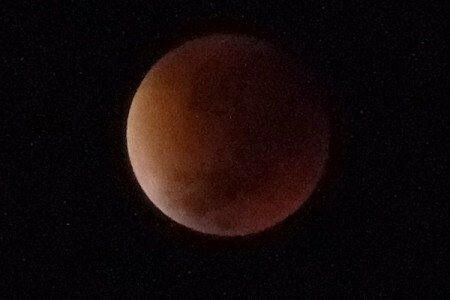 The students also didn’t miss the “super blood moon” on Monday morning. We watched the moon being slowly eaten away by Earth’s shadow, hanging low above Lake Turkana, fainting into the darkness. The view was spectacular! By Deming Yang|2017-01-04T18:04:40-07:00September 29th, 2015|Fall 2015, Field Schools|Comments Off on Geology module begins!